Bolivian Thoughts opinion: Bolivia has certainly lots to offer to the world tourism, our amazing biodiversity, our rich heritage that reflects on all the differences we have among each other, which makes us a great place to visit. When we have a government that enforces laws, halts those irrational road blockades, so that us and tourists can have safe passage, it will be the best possible outcome for our tourism industry! 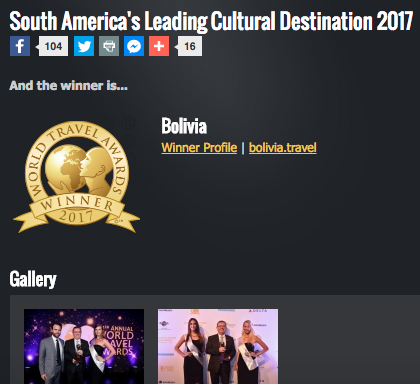 This entry was posted in Bolivia, Environment, Holidays, Tourism and tagged Bolivian cuisine, Bolivian heritage, competitiveness, Culture, government failures, tradition. Bookmark the permalink.